"Values matter," Comey said. "This president does not reflect the values of this country." "The challenge of this president is that he will stain everyone around him," he told ABC, which aired an edited version of the interview but published a full transcript. "I hope not because I think impeaching and removing Donald Trump from office would let the American people off the hook and have something happen indirectly that I believe they're duty bound to do directly." In his book, Comey likens Trump to a dishonest, ego-driven mob boss and says he demanded the then FBI chief's personal pledge of loyalty -- a damning account that has infuriated the president at a moment of intensifying legal pressure on other fronts. "I never asked Comey for Personal Loyalty. I hardly even knew this guy. Just another of his many lies. His 'memos' are self serving and FAKE!" Trump said in one of a series of tweets fired off Sunday before the interview. 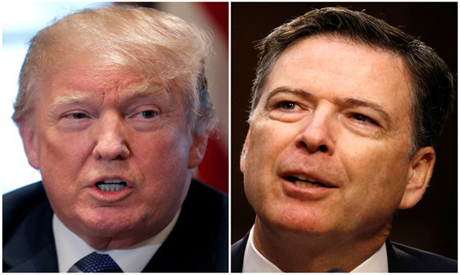 The president said Comey "stupidly" handled a probe into Trump's 2016 election rival Hillary Clinton and how she used a private email server during her time as secretary of state. In another tweet, Trump offered a mini-review of Comey's memoir. "Possibly. I mean, it's certainly some evidence of obstruction of justice," he said. "It would depend upon other things that reflected on his intent."